A great safari for those on a limited budget who still want a top class Luangwa experience with no compromise on levels of guiding, wildlife experience and comfort but who can be flexible with the exact order of camps. 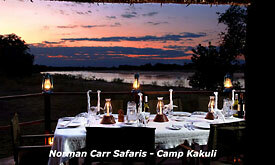 Seven nights spent between at least three Norman Carr Camps (Luwi, Nsolo or Kakuli Bush Camps), the exact itinerary is decided by us, two weeks before travel but we guarantee a smooth running safari. Meet our representative in Lusaka Airport where you will be escorted to your connecting flight to Mfuwe, your gateway to the South Luangwa National Park. Enjoy spectacular views from the air as you fly into the South Luangwa Valley. This flight takes just over an hour. 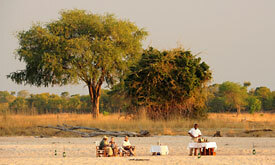 On arrival at Mfuwe Airport, you will be transported to the first camp, where you can settle into your lovely suite. This afternoon after an excellent afternoon tea, you will participate in your first game viewing activity and night drive. On your second day in the South Luangwa a game drive will transfer you to Luwi Bush Camp, giving you great opportunities to see the wildlife during the gorgeous morning light. You will get to camp in time for a sumptuous buffet brunch before having a few hours of ‘siesta’ time to watch the goings on from your room, head to the nearby ‘hippo hide’ or have a proper sleep! In the afternoons you head out on an afternoon walk. 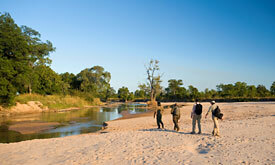 During the next two days you will spend a lot of time on foot, exploring the area around the dry white sand Luwi River. On the morning of day four you will make your way to your next camp either by foot or by road. If you decide to walk, your bags will be waiting for you in your room when you arrive in time for brunch. All the chalets have individual decking and ensuite outdoor showers and toilets. Enjoy the taste sensations of the sumptuous meals, which are often served under the stars. Over the next two days you will participate in twice daily game drives and walks conducted by some of Africa’s best guides. After another Nsolo breakfast you prepare for our adventure to another part of the African bush, making your way to Kakuli Bush Camp. 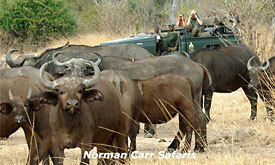 Jump aboard the game viewing vehicle for a game drive or alternatively you can make your way by foot. Kakuli features luxury tents with stunning views of the Luangwa River, which is home to one of the largest concentrations of hippos and crocodiles in Africa. 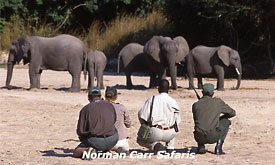 Daily game drives or walking safaris will be conducted in the same manner as previous days.